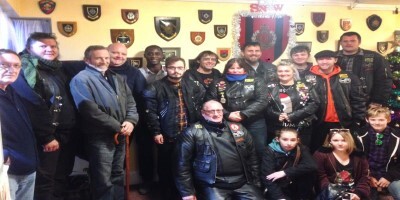 A biker group from Clacton-on-Sea made a 100-mile journey in December to bring festive cheer to veterans. Families from bikers club ‘We Can’t Dance MCC’ decided they wanted to support the charity Veterans Aid this year and organised a collection of special items for the residents of its New Belvedere House hostel. The gifts were delivered, by bike, on Sunday December 11th by a group of club members. Founded in 2014, by local biker legend Wally Walton, the club has strong ties with the Armed Forces; two members are veterans, member Ryan Layton-Smith is still serving with The Rifles and many others have brothers, sisters, fathers or sons in the military. Former TA soldier Amy Searle said, “We wanted to do something for veterans so got in touch with SSAFA for advice. They put us onto John at Veterans Aid and after learning more about the charity’s work we decided it was the one. “The journey took us about one and a half hours,” said Amy. Well done to all at ‘We Can’t Dance MCC Bikers Club’ from the team at GSS for this great gesture in support of Veterans Aid!